This article is about the parish in Eden, Cumbria. For the villages in South Lakeland, Cumbria, see New Hutton and Old Hutton. 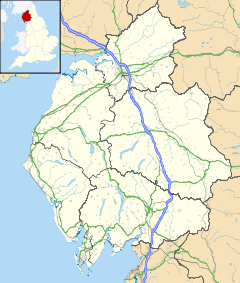 Hutton is a small civil parish about 6 miles (9.7 km) west of Penrith in the English county of Cumbria. The parish contains the small mansion and former pele tower of Hutton John, the seat of the Hudleston family. At the UK census 2011 the parish had a population of 438. The parish of Hutton was created in 1934 from the merger of Hutton John and Hutton Soil parishes, both of which were formerly part of the original ecclesiastical and civil parish of Greystoke. The parish also includes the larger village of Penruddock and the hamlets of Troutbeck and Beckces. Whitbarrow holiday village is also within the parish. Administratively, Hutton forms part of Eden District. It has a parish council, the lowest tier of local government. There are 13 listed buildings in the parish. Hutton John, mentioned above, is Grade I and the remainder are Grade II. ^ "Hutton Parish Local Area Report". 2011 Census Report. Office of National Statistics. Retrieved 1 January 2018. ^ "Hutton Parish Council". Cumbria County Council. Retrieved 1 January 2018. Wikimedia Commons has media related to Hutton, Cumbria. This page was last edited on 4 October 2018, at 01:56 (UTC).